The Renault Z.E. concept hints at the look of the French automakers new-generation of electric cars. 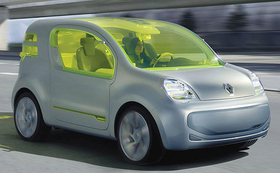 Renault plans to start mass marketing electric cars in 2011. While Renault plans to delay or cancel a number of projects due to the global economic slowdown, CEO Carlos Ghosn promises that the automakers electric vehicle plans are safe. That is good news for Renault Executive Vice President for Engineering Jean-Louis Ricaud, who says electric cars will be more and more competitive against diesels in the coming years. The powertrain expert believes that 10 million electric cars will be sold worldwide by 2020. 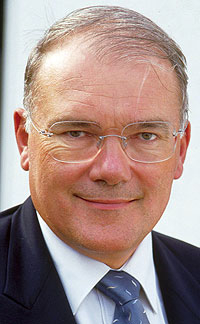 He shared those thoughts and more in a recent interview with Automotive News Europe News Editor Douglas A. Bolduc. How competitive will electric cars be compared with diesels in the coming years? Thanks to our alliance with [Japanese battery maker] NEC, we are now reaching the point where we are able to deliver batteries at a very competitive price. The electricity needed to fill up the battery is becoming cheaper and cheaper compared with diesel. Also, the cost of diesel cars will increase dramatically because of the tougher regulations on emissions. Because of Euro 5 regulations, increasing oil prices, fuel taxes and the decreasing cost for the batteries, electric cars will become competitive with diesels. This will continue because regulations on diesel emissions will get tougher while developing and producing electric cars will get less expensive, batteries will get less expensive, and the price of electricity should be stable, especially if we are using sources such as nuclear power. Therefore it is time to develop the electric vehicle. With electric cars will you start small? In 2011 we aim for a volume of 50,000. That is not really small scale. We would be pleased to sell 50,000 units a year of some of our cars. To move from the prototype stage to an industrial stage you need a large-scale application. The contract with Israel [to deliver electric cars there by 2011] gives us a chance to reach an industrial scale very quickly. The combination of this and the previously mentioned factors makes the electric vehicle move from being a dream to being as close as possible to reality. Which new technologies are lower priorities now, compared to a year ago? One example is the fuel cell. If electric cars develop quickly because of decreasing costs of the batteries, the fuel cell will be pushed further into the future. "It is time to develop the electric vehicle," said Jean-Louis Ricaud. What prediction do you have for electric cars? Many people have made predictions. One forecast is that 10 million electric vehicles will be sold worldwide in 2016. If you look at this based on customer requirements, this figure is not so crazy, but to sell such a high volume you would need to invest a huge amount of money to develop the cars as well as the infrastructures. Therefore I think that 10 million by 2016 is a little too optimistic and unrealistic. I think 2020 is more realistic. What adjustments, if any, will consumers have to make as a result of the switch to cars powered by electricity? What we are trying to do is develop electric cars that do not force customers to change their behavior. There should be no difference to the customer. Of course, the electric car opens the door to by-wire technologies such as drive by wire and brake by wire. They are easier to implement on electric cars than conventional cars. But we will not forget that there are 2 billion people driving the conventional car. You have to respect this. If you make something different some people will choose not to drive such a car. What future do you predict for gasoline direct-injection engines? Will gasoline engines all switch to this technology as diesels all switched to common-rail? as diesels. The cost for such an engine will be close to the cost of a diesel engine. We are developing [a GDI engine] to have it available, but it is not clear whether the market will want it. I am not sure that many people will move to the technology because the advantage over diesel is not so large. But if the price of diesel doubles and the price of gasoline is cut in half, that will change the outlook.